Parish councillors were given an overview of the proposals for a new forest at Doddington North Moor. As we reported last week, a proposal to plant more than 600,000 trees to create the largest new private-sector woodland in England for more than 20 years has been officially launched. Project manager Andy Howard attended Monday night’s meeting of the council at which he highlighted that the UK is one of the least forested countries in Europe, with 11 per cent forest cover compared to a European average of around 30 per cent. This means that we import 80 per cent of our timber, which Mr Howard says is causing concerns for major employers in Northumberland such as A&J Scott, at Wooperton. He explained that if everything went well then the planting would likely start over the winter of 2018/19 and members were keen to hear that over the first three to four years, around 1,500 to 2,000 man hours of work would take place. “Virtually all of it will be local labour,” Mr Howard added. A public meeting is taking place from 5.30pm on Tuesday, October 18, at The Black Bull in Wooler. • A minute’s silence was held as a mark of respect for the late Brian Patterson, who died suddenly at the end of last month. The 58-year-old had rejoined the parish council in recent years following an earlier stint some time ago. Members also agreed to make a £50 donation to The Wooler Doctors’ Fund. • The annual fund-raising coffee morning for the village’s Christmas lights takes place on Saturday, October 22, at 10am in the Glendale Hall. Councillors have also agreed to pay for some permanent Christmas lights to be installed on the church’s clock-tower while the electrician is carrying out other rewiring work. However, members are yet to agree as to whether white or coloured lights would be better and they are to seek advice from the electrician whether the joints between the different strings of lights are reliable. The carol service will be at 6.30pm on Tuesday, December 13, at St Mary’s. • Northumberland County Council will not be able to carry out the agreed 13 cuts at Scott’s Park (above) and Bryson’s Park before the end of September. Twelve will have taken place at Scott’s and 11 at Bryson’s. Therefore to ensure both are tidier over the winter, members agreed for the county council to do an extra two cuts at each park in October. 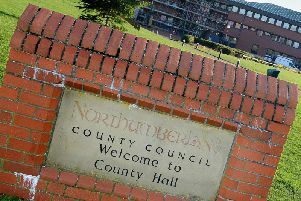 • Preparations are also continuing on Wooler’s neighbourhood plan with draft terms of reference set to be approved at a meeting at the end of October.